Originally released in 1997, this early production from the legendary Dutchman Gerd has recently enjoyed a revival, the rare wax finding its way back into the sets of Raresh, Ryan Elliott and Bass Culture label boss D’julz, amongst a few happy others. After seeing on a number of occasions the magic effect ‘Mass Majestic’ could have on the crowd, the catchy hook appealing to all ears, D’julz knew what the next release had to be. With scarce second-hand copies hotly in demand, this secret weapon is about to see a new lease of life via Bass Culture. Reissued in a remastered and slowed down version, ‘Mass Majestic’ is one of those tracks which stays on your mind long after the party is over … the haunting keys, the intensity of the synths and the climax of clashing symbols, all driven along by the raw chugging bass-line makes this a peak-time winner. The flip side features ‘To Reach’, another track from the original EP. A big room monster of rolling bass and syncopated keys, its old skool charm and brash energy grabs you to full-on, trippy effect. 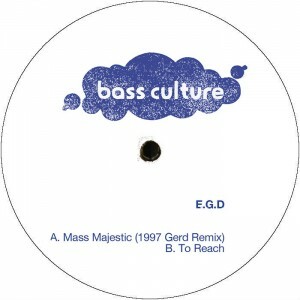 Considered a prolific, timeless and highly eclectic producer, ‘Mass Majestic’ EP indulges in Gerd’s blatant ballsy Techno side, remaining an extremely effect DJ tool 17 years on. This entry was posted on December 29, 2014 at 10:50 and is filed under Release.